Have you ever sat down to teach a loved one crochet and run into some hiccups through the process? 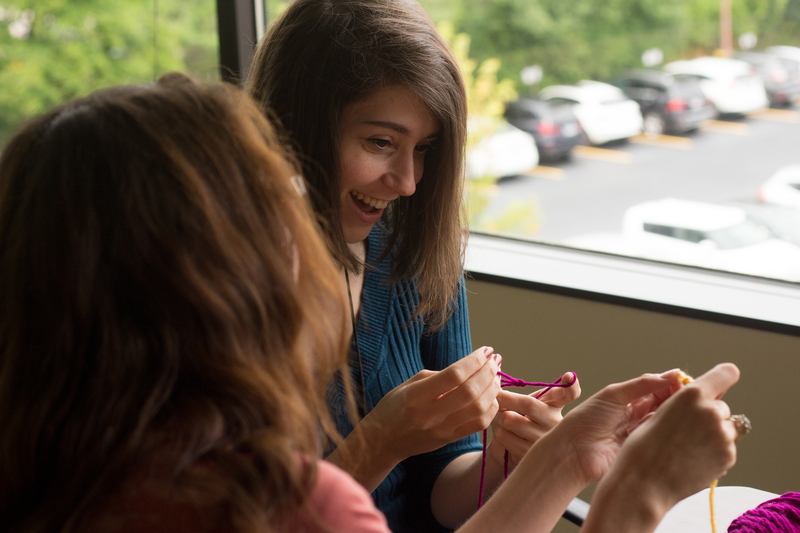 Teaching isn’t always as intuitive as doing, so read this article to learn some of our favorite tips to teach crochet to anyone. Teaching crochet doesn’t have to be intimidating! While teaching is a skill in itself that takes practice and refining—just ask any teacher—you can learn some basic tips and tricks for teaching so your loved ones can learn a skill near and dear to your heart. Create a basic lesson plan. I suggest teaching ch, sc, and if there’s time, dc. You’ll also want to teach finishing and weaving in ends. If you only get to single crochets, that’s totally fine! However, if your student masters double crochet as well, this opens up an entire world of intermediate crochet stitches that are usually made up of some combination of these basic stitches, anyway! Note: Bear in mind all of the individual skills you’ll have to teach. Not only are you teaching the mechanics of a single crochet stitch, but how to end a row, chain, turn, etc. Leave room to improvise. Expect that teaching the slipknot will take you longer than expected (trust me). People are going to struggle with holding the hook, with tension and with holding the yarn. Their yarn tail is going to flail all over the place. They will have a hard time determining exactly where to place their hook. Be patient and expect the basics to take time. Watch videos to see how other crocheters teach. I found this step to be invaluable. While you can probably do a slipknot without even thinking about it at this point, your students might really struggle to grasp the new concept. There are several ways to teach how to do a slipknot. Look online for some inspiration and also examine your own fingers closely as you make a slipknot. How can you explain to your student exactly what you’re doing? Think about this ahead of time and class will flow more seamlessly. Determine the size of your group. Are you teaching just one friend, a few close friends, a group of ten coworkers or a birthday party? Each group size has different requirements. You want the ratio of instructors to students to be as small as possible. For example, when we held knitting and crochet classes in our office in the fall of 2016, about twenty people signed up to participate. That is way too many students for one teacher! We had five people teaching the class, so the teacher-student ratio was 1:4. Determine your time frame. I found that two hours was a really comfortable amount of time to dig in without the students getting overwhelmed and it allowed plenty of time to practice. Visual aids don’t hurt. I once attended a knitting class where the instructor printed out images and the basic stitch pattern for several common knit stitches like stockinette, garter stitch, and ribbing. Printing a visual aid of the different basic crochet stitches (chain, single crochet, double crochet, half double crochet, and even treble crochet) would be a wonderful resource for your student to take home after you’ve spent the afternoon together. Bring completed projects to class. Another example of a visual aid is showing your student(s) projects you’ve made before! These can (and should) range in experience level from basic to advanced. Inspire your students by showing them a simple single crochet swatch they could make themselves by the end of class and an advanced lace doily (this is what they’ll be able to achieve after some practice). Slow down. It’s easy to get into the rhythm of things and go at a normal pace, but your student is going to need to you go slow so they can learn. Similarly, repeat each skill multiple times together to better grasp it. Don’t assume your student was able to follow you perfectly after you showed them something once. Repetition is key when it comes to teaching crochet. Understand that your method might differ from your student’s. Make sure you research a few different ways to hold your crochet hook and yarn, for example. There is the knife grip and pencil grip for holding your hook and when it comes to holding your yarn, there are tons of different ways to hold it while maintaining tension (although I wouldn’t worry about tension when teaching this beginner class). Some people loop the working yarn around their pinky finger, others hold it near their middle or pointer fingers. Allow your student to hold the yarn and hook in whatever way makes sense to them, offering guidance if and when asked. Look at the finished product, then examine the process. On a similar note to above, don’t get caught up in the differences between your crochet method and how your student crochets. If their single crochets look like single crochets, it doesn’t matter if they held their yarn a little differently to get the same effect! Explain the WHY whenever possible. Telling your student that you chain one at the end of a single crochet row to account for the height of the next row will help them remember the importance of this step. Seize any other opportunities possible to explain the why. Something I like to tell students as a fun fact is comparing knitting to crochet: knitting is like weaving, while crochet is like tying knots. Background information can aid in understanding. Give tons of encouragement! They say that for every piece of criticism you give, you should offer five pieces of praise. This applies in the business setting and in the teaching setting as well! It’s easy for new crocheters to feel discouraged ¾ just think back to when you first learned ¾ so be sure to remind them that it is a challenging craft to learn, but they can do it! Leave time for a break. If a class lasts more than an hour, a break to refresh and reset is definitely a good idea. If you’re having the girls over to learn crochet, halfway through take a break to make some tea and have some snacks. Provide some great beginner-friendly projects to try. Dishcloths and scarves are some of the most wonderful beginner projects, especially when using a bulky yarn! If you have a list handy of some of your favorite easy patterns, feel free to print them out for your students. Is your swatch looking triangular? Do not forget to chain at the end of each row. Similarly, count your stitches. This will ensure your swatch comes out square and not like a trapezoid. If you’re struggling with a pattern, the most important thing is to keep trying at it and working through it. New crocheters and even seasoned crocheters who are learning a new skill have a tendency to look at a pattern and think, “Well, that doesn’t look right.” I’m guilty of staring at patterns angrily without actually trying out the stitch. What usually ends up happening? I try the stitch and it works out fine! 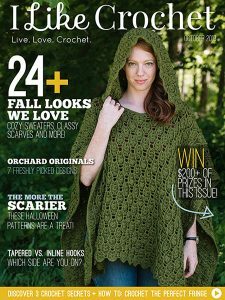 Especially if you’ve purchased a pattern from a designer like the patterns found in I Like Crochet, the patterns are tech edited! In conclusion, don’t let the look of a pattern overwhelm you: it’s better to try it out and pull out a couple rows than getting frustrated and never starting. Let your perfectionist tendencies take the back seat for a while. Maybe your project isn’t turning out with flawless tension. Maybe you added an extra stitch somewhere along the way and the inaccuracy is driving you nuts. Do not, in a frustrated frenzy, rip out your entire project. There is no quicker path to discouragement! Crochet is very forgiving. No one will ever notice that extra stitch you added, and if your tension’s off, often this can be fixed by blocking. Consider these “happy accidents” as Bob Ross would say, or “design features.” Happy crocheting! Thank you for this information. This has been my life dream to teach crocheting. I have been crocheting since I was 12. I would like to get more info on the process of teaching.